These little brown bears actually come in one of kid's favorite flavors - chocolate. 1. PREHEAT oven to 350°F. Beat butter, sugar, dry pudding mix and egg in large bowl with electric mixer on medium speed until well blended. 3. ROLL out dough on lightly floured surface to 1/4-in. thickness. Cut out the dough into bear shapes using a 4-in. cookie cutter; place on greased baking sheet. Reroll scraps and cut additional cookies as needed. 4. 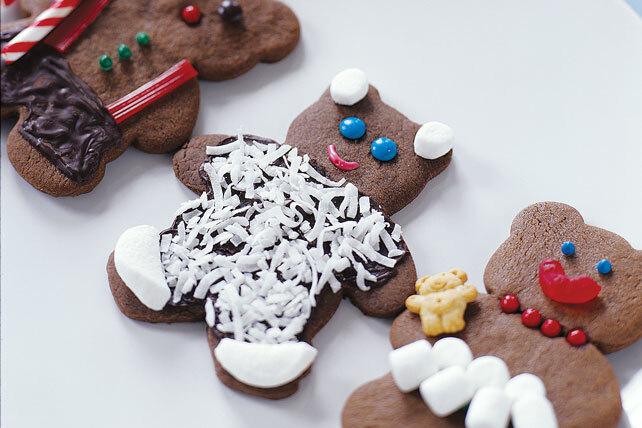 DECORATE cut-outs with small candies, raisins or sprinkles for eyes, mouth and buttons, pressing in lightly. Bake 12 to 14 min. or until slightly firm. Remove from baking sheets. Cool on wire racks. 5. MELT chocolate in microwavable bowl on MEDIUM for 2 min. Spread on bottom half of bears for pants or skirts; use as glue to attach more decorations. Makes 20 servings, 1 cookie each.